On behalf of Dean Applegate and the Board of Directors of Cantores in Ecclesia, Ltd., we thank you for your interest in the William Byrd Festival. It is our hope that this annual event will raise awareness and appreciation for William Byrd, arguably Renaissance England’s greatest composer. Each summer, some of the world’s foremost Byrd scholars and practitioners are invited to Portland, Oregon to bring alive the music of this master of motets and madrigals through recitals, lectures, liturgical services and concerts. We need support to keep this festival affordable. 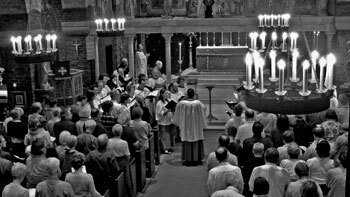 Apart from two ticketed concerts, festival events are open to the public without charge, with free-will offerings at Choral Evensong and Mass. Your donations help bring outstanding artists and musicologists from throughout the United States and Great Britain, provide for housing and hospitality, print programs, pay for publicity, and cover the many other expenses of sponsoring a festival of this scope and scale. Join us in securing the festival’s future with a generous contribution today. To ensure your gift is deposited directly into the choir’s Festival Account, clearly indicate “Festival” on the envelope or memo column of your check. The musicianship and scholarship that goes into each year’s festival is impressive. Help keep these standards high with a tax deductible donation to Cantores in Ecclesia (Federal Tax I.D. # 41-2042868). If you are unfamiliar with the choir and its work, we encourage you to visit us at www.cantoresinecclesia.org. Thank you, and we hope to see you at this year’s William Byrd Festival.